The multi award-winning Report-IT has revolutionized newsgathering and live remote broadcasts to ensure you can go live first! At the touch of a button broadcast live IP audio over 3G, 4G or Wi-Fi from any remote location to an IP codec in the studio. Perfect for remote broadcasts, live reports or two-way interviews, simply connect earphones to your phone and hear studio communications and program audio in real-time while broadcasting. Attach a professional dynamic mic to your phone using a compatible third-party microphone adapter cable. Where others have failed, Report-IT has succeeded. The low delay Opus and Tieline Music coding algorithms, offering 15kHz quality at bit rates as low as 24kbps! Fast, secure and flexible deployment with full remote control of every user account from anywhere with an internet connection. Forward Error Correction (FEC) and Automatic jitter buffering with minimum and maximum jitter configuration. Connections to non-Tieline N/ACIP 3326 compliant codecs with an optional SIP for Report-IT Enterprise Tieserver subscription upgrade, or the Report-IT SIP app. Burli and Nétia Radio-Assist ingest and content management software. TwistedWave or Nétia iSnippet audio editing apps for iPhone, or any compatible Android editing apps. Go live from an event or a sponsor’s business at the touch of a button. Consider a scenario where no journalists or edit booths are available and you need to go live with a news flash, or interview someone famous or important. 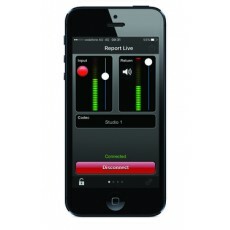 With Report-IT Enterprise you can ask any remote talent to simply download the app onto their smartphone for free, enter a username and password set by your station engineer, hit ‘connect’ and be interviewed live by the studio in seconds! Report-IT is great for repackaging content. We've been asked, "what if a live or pre-recorded interview experiences wireless network dropouts?" No problem, simply configure Report-IT to record talent audio onto the phone by default when you are interviewing them. Send the flawless 20kHz recording to the studio after the interview at the touch of a single button for editing or repackaging. Now that's cool! Poor cell-phone audio quality is a thing of the past because iPhones and most Android smartphones have very high quality inbuilt microphones capable of delivering high fidelity live audio and recordings. You can also attach a professional dynamic mic to your phone using a compatible third-party microphone adapter cable.